Duzce University Journal of Health Sciences Institute (DU Sağlık Bil Enst Derg, Duzcesbed) is an international refereed journal and published 3 times a year (January, May, September). Special or additional numbers may also be published where necessary. The independent double-blind peer review has accepted the evaluation process. Open Access and online publishing journal. Research studies in the field of research are being evaluated from the original research, review, case report and other (editorial comment / discussion, letter to the editor, scientific letter, surgical technique, distinctive diagnosis, original images, diagnosis evaluations?, medical book reviews, question- answers) from health field researches. Applications of Health Sciences Institute students and faculty members, Faculty of Dentistry, Faculty of Pharmacy, Faculty of Veterinary, Faculty / Vocational School of Health and other health field researchers are accepted. The language of publication is Turkish or English. 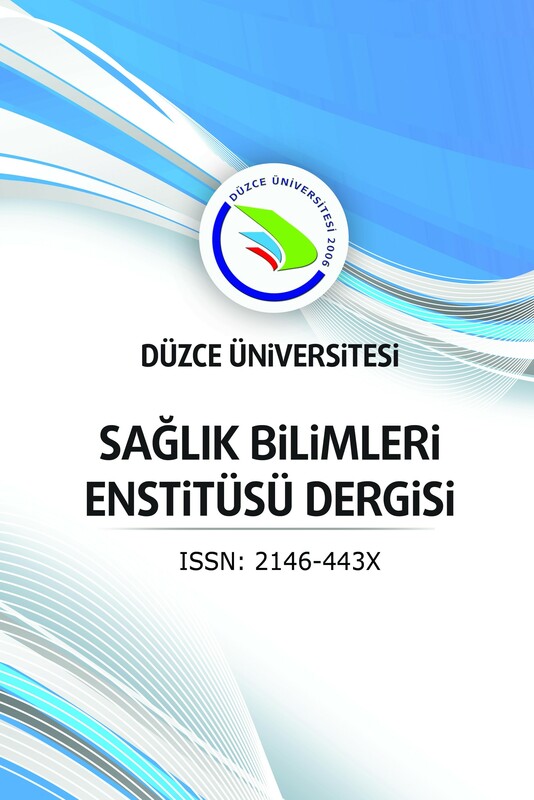 Those who want to submit manuscript for the publication to Journal of Duzce University Health Sciences Institute should send their articles as members to the Manuscript Tracking System at "http://dergipark.gov.tr/duzcesbed". Each manuscript uploaded to the system of Journal of Duzce University Health Sciences Institute is first evaluated by the editor in chief or section editors in terms of compliance with the writing and publishing principles of journal. Where appropriate, the manuscripts will be sent back to the editor for review. While the appropriate manuscripts are taken into consideration to peer review, the inappropriate manuscripts are returned to the author for editing. After editorial approval, the manuscript is sent to independent two reviewers who are specialists in the field. The names of the reviewers and authors are mutually kept confidential (double-blinded). The manuscript evaluation period of the referees is maximum 15 days. At the end of this process a new reviewer is appointed for the manuscript not reported by the reviewers. A manuscript getting two positive reviewer reports from the field evaluation is eligible to be published. A manuscript that receives both a positive and a negative reviewer reports is sent to a third reviewer and whether the manuscript will publish or not is determined in the direction of the third reviewer report or editor's decision. The required correction period from the authors is maximum 15 days. Editors may decide to publish or not to publish a manuscript. Manuscripts complete the process within 2-3 months on average. All the processes in from the submission to the publication stage of manuscript are made electronic media. For publication, the publication and publication rights of the articles sent to the Journal of Duzce University Health Sciences Institute are transferred to the journal. These manuscripts cannot be published, reproduced or used in any other media without permission from the journal management. There is no charge for the articles to be published in the journal. Editorial Board of the Journal of Duzce University Health Sciences Institute complies with the criteria of the International Council of Medical Journal Editors (ICMJE), the World Association of Medical Editors (WAME), and Committee on Publication Ethics (COPE). All articles are detected for similarity or plagiarism. Our journal is registered with "Turkish Citation Index", "TR Index (ULAKBIM)", "Turkish Medline National Health Sciences Periodical Publications Database", "Google Scholar”, "Index Copernicus", "Google Scholar", "Academic Resource Index (ResearchBib)", "Sobiad", "Scientific Indexing Services (SIS)", "ROAD", "Scientific World Index (SCIWIN)" and "CiteFactor".